Let me first admit, until I read the announcement post for this month’s MxMo, I had never heard about shim cocktails. But I like the concept and the challenge. My ToniCoffee Punch is probably not for everyone. There are some pretty harsh flavors involved, but I love it and can’t wait for summer to return, so I can drink it on my patio. The inspiration comes from several places. 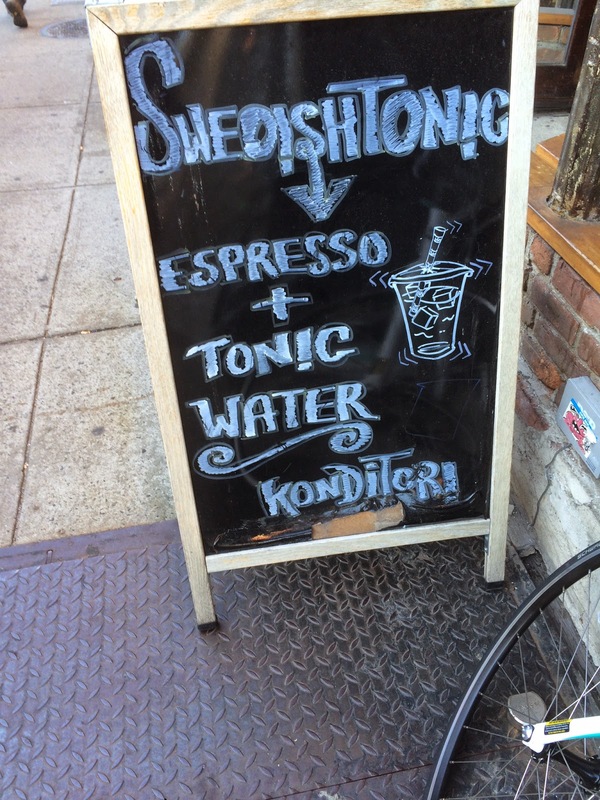 First, on a recent visit to New York - where I had the good fortune to stay in Brooklyn in stead of Manhattan and there for saw neighborhoods I had never thought to visit - on a morning constitutional along Smith Avenue, I passed a sign describing a Swedish Tonic. It was in front of an actually Swedish Bakery right there in Brooklyn. I had a peek inside - and a sniff of their delightfully smelling cinnamon buns - but I was on my way to Momofuku Milk Bar and didn’t want to spoil my appetite. So I snapped a picture of the sign and went on my way, reminding myself that I could get to a bakery in Sweden from my home in an hour and a half. 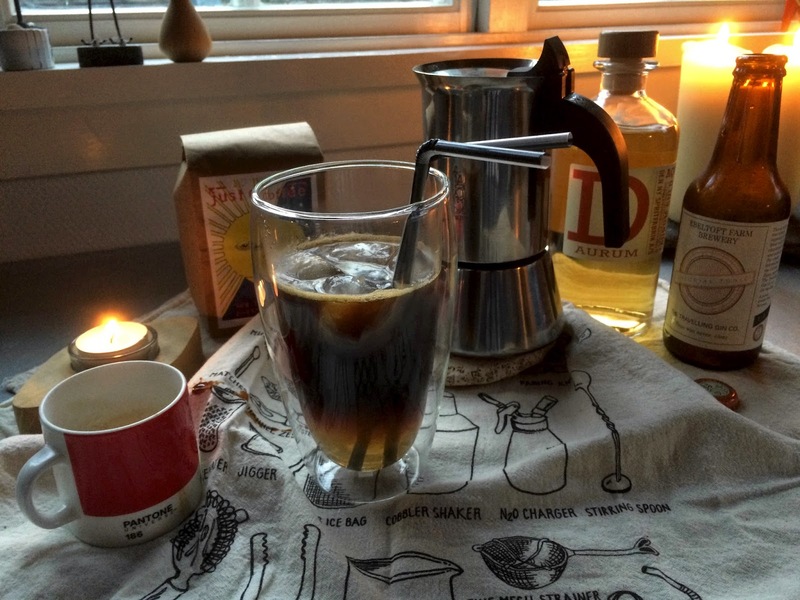 And also reminding myself to learn more about a mixture of tonic water and espresso. Since I have learned that it was first created in Helsingborg Sweden, at Koppi - a coffee shop one and a half hours travel from my front door, so I am planning a trip. The people at Koffi may have been inspired by a Norwegian barista. (link in Swedish). And that started my second line of thought. How Scandinavians have always loved their coffee and how integral to our cultures coffee have always been. (Add in Finland for the Nordic vibe and you will find all four countries on the top 10 list of coffee consuming countries). 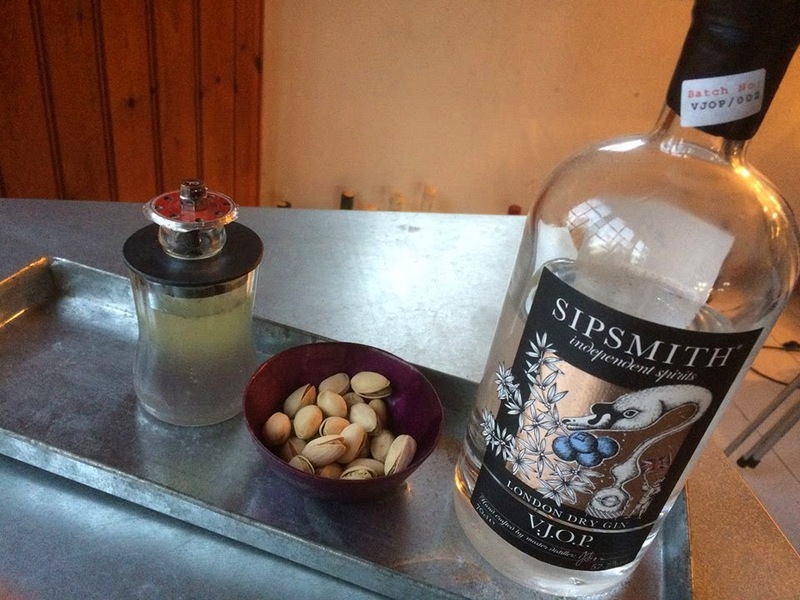 A few years back I made myself a cocktail in honor of the old Danish tradition going back to the start of the 17th century of mixing coffee and aquavit - or snaps as we call it. Back then it was called Strong Coffee to set it apart from Coffee with out the aquavit and later on it gained names like “a small black” and coffee punch. 15 cl tonic - I used Colonial Tonic from Ebeltoft Gårdbryggeri (farm brewery) a golden, bitter and very lovely tonic. Start by making the coffee - I used this Cuban coffee method - if you use a regular espresso maker just stir in the sugar once you have pulled a shot.